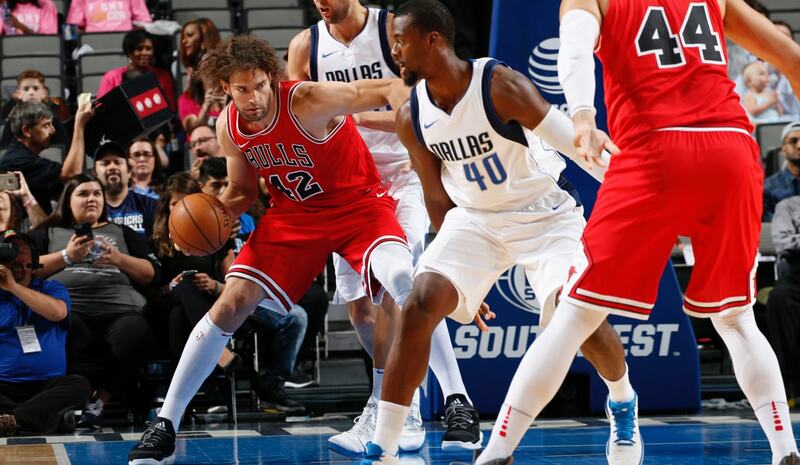 In a sonnet for defeat, let us count the ways the Bulls Wednesday lost 118-71 to the Dallas Mavericks. For it was to the depths, breath and height of despair they felt deep in their souls. ---- Cursory defense with the Mavs making 18 threes and shooting 50 percent overall. Though the Bulls did trim a 48-point deficit to 47 at the final buzzer. Anyone seen that drawing board? Robin Lopez and Paul Zipser led the Bulls with 12 points each, the only Bulls to score in double figures. Though Lopez did play well, going at Dirk Nowitzki successfully to start the game. The Mavs, like much of the NBA, have gone to the spread, pace, shooting offense, leaving no real position for a veteran mid range shooting power forward like Nowitzki. So they are playing him at center, and Lopez had success to start shooting hooks and driving past the anchored veteran. "This is a great opportunity for us to look at film and get better because of this game. You have nights like this with a young group; you have to dig deep, get back to work and hopefully get better the next one." The Bulls actually led late in the first quarter and into the second with some athletic plays. David Nwaba slammed in a driving baseline dunk. He fell hard and appeared to hurt his right hand. He was wearing a wrap afterward, but he said there was no damage. 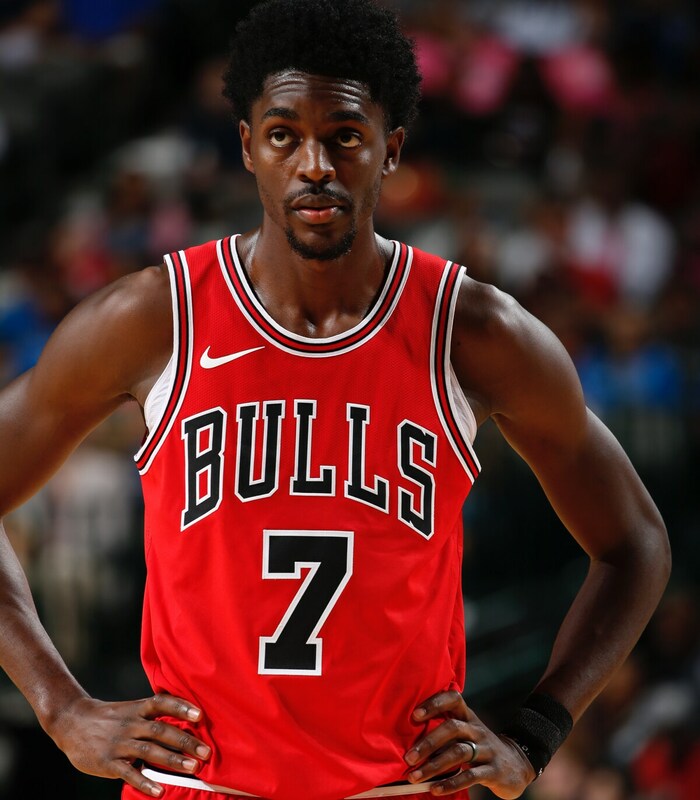 Bobby Portis, whose defensive rebounding was about the best thing the Bulls had going, threw a half court bounce pass to Cristiano Felicio for a three-point play as the Bulls tied the game. And they came back some, like they did in New Orleans, late in the second quarter on a pair of Justin Holiday scores with a three after the Mavs led by a dozen. The Bulls still trailed just 49-43 at halftime. But the signs weren’t positive to start the second half this time, unlike in the Game 1 win, with Kris Dunn and Nikola Mirotic starting this game for Jerian Grant and Portis. Lopez, Holiday and Zipser appear to be the core for now. Dunn, who finished with two points on one of nine shooting and six assists, was stripped on a break and then failed to finish an open drive. Grant was able to finish later in the quarter as the Bulls still trailed just 62-57. But the Bulls continued to take rushed shots and the Mavs began raining down threes. It was 74-60 after three and then, whoop-there-it-is, 82-60 just over a minute into the fourth quarter. As good a game it was for both point guards against the Pelicans, it was as poor in Game 2. Dunn started and seemed uncertain with his shot. Grant had five assists, but little penetration to set up better shots. They combined for Grant’s two free throws in 41 minutes. Even with the 1-1 start, getting to the free throw line for easy points has been an obvious team deficiency. Way too many long jumpers. Dunn appears the more explosive, but seems to be playing tight, not attacking to create shots. 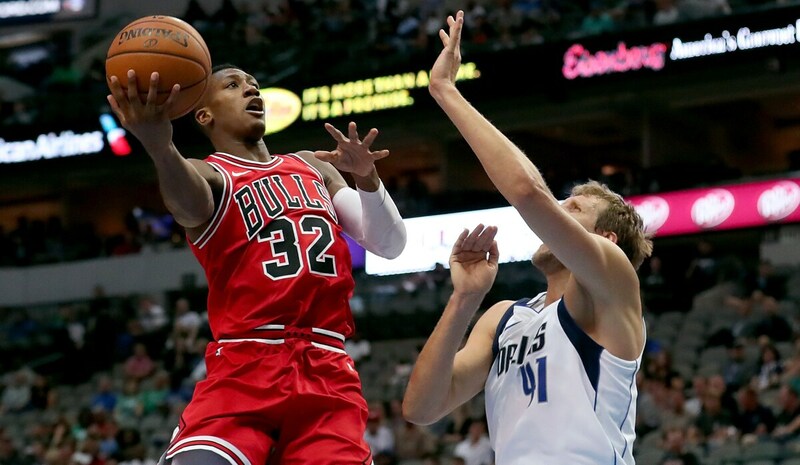 The Mavs did that much better with rookie Dennis Smith with 14 points and J.J. Berea with 11. They were led by Harrison Barnes with 17. The Bulls still were missing Lauri Markkanen with a back issue. Zach LaVine is out from ACL surgery. The Bulls overcame their failure to get to the free throw line in Game 1 with good shooting, but it’s problematic to rely on the shooting so much. Zipser shot well, but Mirotic was off target too often, those long rebounds, as we have heard, leading to fast breaks and better shots for the opponents when the defense doesn’t retreat. Until defeat. The Bulls play their exhibition home opener Friday against Milwaukee.